IT service management has had a bad rap – being viewed as reactive, inefficient or outdated. But according to a recent study done by Enterprise Management Associates (EMA™), that couldn’t be more far from the truth. Based on a survey EMA conducted with nearly 300 companies, ITSM is a hub of innovation, unifying IT across many silos. ITSM technologies and roles are evolving. 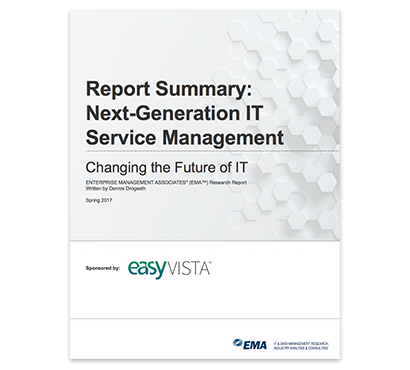 This report captures the “next-generation ITSM” phenomenon by looking at ITSM from many dimensions.